Objective: To investigate the relationship between VEGF SNPs+936C/T, -634G/C, -2578C/A, -1154G/A and risk of Preeclampsia (PE). Methods: A total of 108 cases and 108 normal pregnant women as control in a Chinese population. Polymerase Chain Reaction (PCR) amplification of the genes and sequencing methods were used to genotyping VEGF SNPs +936C/T, -634G/C, -2578C/A and -1154G/A. Results: Alleles and genotypes of VEGF -634G/C, -2578C/A and -1154G/A showed no statistical significant difference between PE patients group and the control group (P>0.05), while VEGF +936C/T TT genotype and T allele frequencies were significantly higher than those with the CC genotype, OR value were 1.68 (1.17-2.24) and 1.32 (1.09-1.69). Conditional logistic regression analysis showed that +936C/T TT genotype and T allele had no statistical significance with environmental related factors. Conclusions: We observed that the VEGF +936C/T TT genotype and T allele were associated with the risk of preeclampsia for gestations in Chinese pregnant women. More studies with larger sample size, better design, and using detailed patient records need to be conducted. Vascular endothelial growth factor (VEGF), Preeclampsia, Genetic polymorphism. Preeclampsia is a pregnancy specific disorder, accompanied by systemic multiple organ dysfunction or failure, severe convulsions, coma and even death [1-3]. It leads to 76,000 pregnant women and 500,000 cases of neonatal death every year, and occupied 6%-8% of all pregnancy [4,5]. The incidence rate of PE was about 9.4%-10.4% in China [6,7]. The disease often occurred after 20 weeks gestation, manifested as hypertension, proteinuria and edema, seriously influenced maternal and infant health [1,8]. The common clinical risk factors of preeclampsia refer to primipara, pregnant women over the age of 40, BMI>30 kg/m2, history of preeclampsia or eclampsia family, multiple pregnancy and chronic systemic disease . The pathogenesis of PE was not yet fully understood. The placental trophoblast cell ischemia, vascular endothelial injury and dysfunction are reported to be associated with the development of preeclampsia [10,11]. Several studies showed that endothelial cell injury and dysfunction were the core pathogenesis of preeclampsia, the soluble vascular endothelial growth factor receptor-1 (sFlt-1), placental growth factor (PlGF), and 25-hydroxy vitamin D (25- OH-VD) could reflect the functional status of vascular endothelial in maternal blood circulation, which had the closely relations with the occurrence of preeclampsia [12-14]. Vascular endothelial growth factor, also known as vascular permeability factor, has a strong promotion for differentiation, proliferation, migration and invasion of endothelial cell . It has important significance to maintain the function of endothelial cells on the formation and regulation of angiogenesis. Its biological functions can be performed through the endothelial cell specific receptor (VEGF-R), mainly for NEGF-R2 . Human VEGF gene is located on the chromosome 6p21.3, the full length is 28 Kb, and encoding gene length is 14 Kb, consisted 8 exons and 7 introns. The coding product is a two-bond-linked glycoprotein, due to different splicing site of the gene, 7 subtypes of proteins can be found . The biological function of VEGF was increased permeability of capillaries and small veins, mainly for the blood capillary vein . Specifically, the expression of VEGF in placenta has a special role in the function of endothelial and trophoblast cells, playing an important role in the formation, development and maintenance of placenta. The early development of placental trophoblast cells and the development, proliferation, migration, differentiation and infiltration of endothelial cell interacted with each other [19,20]. Because of the need for foetal growth and angiogenesis, VEGF and its receptor system have significant role in the development of the embryo. Subtle expression changes of VEGF during embryonic development can lead to deformities or embryonic death . Some studies showed that VEGF gene polymorphisms were involved in the regulation of protein expression, increasing the susceptibility to preeclampsia, but the results were inconclusive [21-23]. However, no study investigated their association in Chinese pregnant women. Therefore, our study firstly attempted to find out the relations between preeclampsia and its gene polymorphism in pregnant women. A total of 108 cases of preeclampsia patients were collected from Apr 2012 to Nov 2015 in the Department of Gynaecology and Obstetrics of Jinan Central Hospital Affiliated to Shandong University and Dongchangfuqu Maternity and Infant Healthy Institute. The diagnosis of PE was determined by the American College of Obstetricians and Gynaecologists criteria (ACOG Committee on Practice Bulletins-Obstetrics, 2002). The criteria for PE patients were as follows: blood pressure ≥ 140/90 mmHg persisting for at least 6 h; proteinuria >0.3 g/day after the 20th week of gestation. Blood pressure was measured with a mercury sphygmomanometer and the Korotkov sound technique. All patients had proteinuria ≥ 3+ or 4+ tested by dipstick in at least two random urine specimens obtained at least 4 h apart or protein excretion rate exceeded 5000 mg/24 h. Furthermore, at least one of the symptoms was present: headache, visual disturbance, epigastric pain, dyspnea, oliguria, thrombocytopenia, elevated concentration of lactic dehydrogenase and aspartate aminotransferase and alanine aminotransferase activity. Patients with chronic hypertension, pregestational diabetes and chronic renal disease were excluded. All the patients aged from 32-38 y old, the average age was 35.2 ± 3.3 y. Simultaneously, a total of 108 nulliparous control group women were selected with uncomplicated pregnancies from Jinan Central Hospital Affiliated to Shandong University and Dongchangfuqu Maternity and Infant Healthy Institute. One control subject was selected after enrolling one patient, and they were matched with age. The medical histories, maternal age, gestational age at delivery and smoking habits were recorded and pre-pregnancy BMI was also calculated. Women in the control group aged from 28-37 y, the average age was 34.6 ± 3.8 y. All the subjects were unrelated Chinese Han population; and excluded the other systemic diseases. Preeclampsia group and the control group in age were matched, and all the subjects were informed in detail about the study and provided their written consent to collect venous blood samples for diagnostic and scientific purposes including genotyping. This study was approved by the ethics committee of our hospital. Blood samples were collected in peripheral venous blood for 5 ml; the white cell was handled with Blood DNA extraction kit (QIAamp) to extract genomic DNA and stored at -20°C preservation for genotype analysis. PCR amplification and DNA sequence analysis method were used. VEGF SNPs +936C/T, -634G/C, -2578C/A and -1154G/A were regarded as the research targets. The primers were designed with Clone Manager Professor 8.0 and synthesized by the Shanghai Sang Gong production company, the primer sequences were shown in Table 1. PCR reaction system was 50 μl including: dNTPs 75 μM, 20 ng genomic DNA, 50 nM primers, MgCl2 3.5 mM and Hotstar Taq 0.5 U enzyme. The 96 hole plate was used for PCR reaction: 94°C 15 min, 94°C 30 s, 55°C 30 s, 72°C 60 s, 40 cycles, and the last was 72°C 7 min, finally placed at 4°C. The PCR products were sequenced (TaKaRa); the results were analysed by DNA Star software, and compared by MEGA5.0 software (Figures 1 and 2). Figure 1. 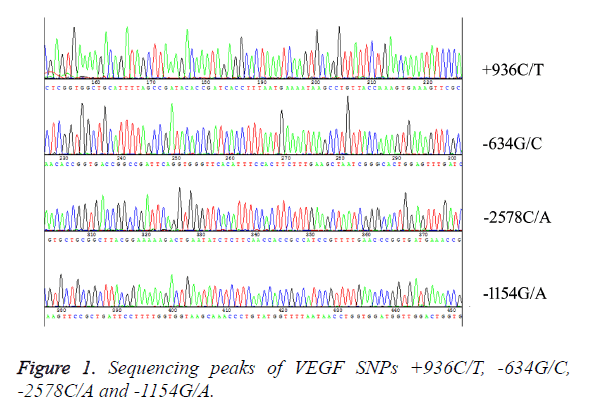 Sequencing peaks of VEGF SNPs +936C/T, -634G/C, -2578C/A and -1154G/A. Figure 2. 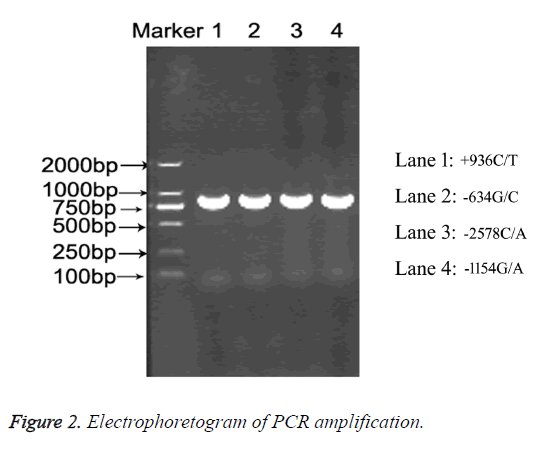 Electrophoretogram of PCR amplification. SPSS17.0 software was used for statistical analysis. The general data of the patients group and the control group were compared by t-test or χ2 test. The genotype frequency of the control population was tested by χ2 goodness-of-fit Hardy- Weinberg equilibrium (HWE), in order to describe whether there was a group representation. In patients group and control group, the differences of genotype frequencies, allele frequencies were tested by χ2 test, and the single factor and multiple factors conditional logistic regression were used to calculate the OR values and 95% CI values. With statistical significance of genotype was analysed by conditional logistic regression analysis of interaction between genotype and environment related factors, such as maternal age, gestational age at delivery, smoking and BMI before pregnancy. P<0.05 was recognized as statistically significant. The general situation of the patients and control group were shown in Table 2. The maternal age, BMI index, smoking proportion between PE patients and control groups had no statistical significance (P>0.05). The average weeks of hypertension appeared for preeclampsia patients were 29.7 ± 3.1 and 30.1 ± 3.4 for proteinuria. Table 2. The general situation comparison between patients and control groups. Distribution of +936C/T, -634G/C, -2578C/A and -1154G/A loci in the two group were in accordance with Hardy Weinberg equilibrium (P>0.05). The distribution and allele frequency of four loci for the susceptibility of preeclampsia in the patients and control group were found in Table 3. Alleles and genotypes of VEGF -634G/C, -2578C/A and -1154G/A frequencies in patients with PE and control group had no statistical significance (P>0.05), while +936C/T between patients group and the control group had significant difference (P<0.05). Multivariate conditional logistic regression analysis after adjustment for age, smoking, and medical history of PE factors found that compared with CC genotype and C allele, TT genotype and T allele increased preeclampsia risk significantly for +936C/T loci (adjusted OR=1.68, 95% CI: 1.17-2.24), and (adjusted OR=1.32, 95% CI: 1.09-1.69). 1Adjusted for age, medical history and smoking. Table 3. Distribution and frequency of four loci with susceptibility of PE in this study. Gene-environmental related factor interaction analysis for genotype and susceptibility to PE was also performed. The results were shown in Table 4. Compared with the CC genotype and C allele, patients carried TT genotype and T allele in PE patients group had no statistical significance with environmental factors. Table 4. Gene-environmental factors interaction analysis of SNPs+936C/T with susceptibility to PE. The etiopathology of preeclampsia remained undefined, while improper placentation has been suggested as a possible etiologic factor . The process involved the abnormal infiltration of the cytotrophoblast into the decidual endometrium and development of the spiral arteries originated from the myometrium. As a result, the diameter of the spiral arteries enlarged, and arteries lose elasticity to allow an increased demand of blood flow, and couldn’t satisfy the intensity demands of the growing foetus [25,26]. VEGF was thought to be essential for integrity of the maternal endothelial cells. Previous studies have shown that expression of VEGF has been implied as a hypoxia induced factor, and possibly associated to PE. Gu et al. found increased mRNA and protein levels of hypoxia in cultured cytotrophoblasts . Zhou et al. indicated that cytotrophoblast differentiation and invasion during pregnancy was regulated through the VEGF receptor-2 . The cytotrophoblast survival was deregulated in severe forms of PE. VEGF is a multifunctional cytokine, played an important role in angiogenesis in vivo. It acted a crucial role in physiological vasculogenesis and vascular permeability . There were several SNPs in the VEGF gene, including +936 (rs3025039), -634 (rs2010963), -1154 (rs1570360), and -2578 (rs699947) positions, these SNPs could alter gene expression and protein production, and change the risk of developing diseases characterized by deranged angiogenesis . Specifically, +936C/T located in the 39-untranslated region, -634G/C in the 59-untranslated region, -2578C/A and -1154G/A in the promoter region . VEGF has been suggested to be involved in the pathogenesis of PE rather than being an effect of the disease. It has been demonstrated that mice lacking VEGF allele in renal podocytes developed the typical renal pathology found in pregnant women with PE, which comprises additional evidence for a critical role of VEGF in renal disease during PE . Several researches have reported an association between polymorphisms and PE in selected populations, with some discrepancies. Garza et al. found no association between polymorphisms of the vascular endothelial growth factor gene and preeclampsia in Mexican women . However, Papazoglou et al. indicated that a statistically significant difference for allelic frequencies of the +936C/T polymorphism between women with severe preeclampsia and controls . Banyasz et al. declared that an only after adjustment of -2578C/A association for risk factors of PE . In our study, we found compared with CC genotype and C allele, TT genotype and T allele increased preeclampsia risk significantly for +936C/T SNP, other SNPs have no relation with PE in Chinese pregnant women. VEGF +936C/T TT genotype and T allele had no interaction with environmental related factors. Our study had similar results with Papazoglou et al. but different from others. The different research results maybe refer to significant differences in VEGF gene polymorphism in different populations and regions and selection bias etc. [23,32]. There are two limitations in this study. Firstly, all the study participants had been recruited from only one hospital located in a single city in China, and thus, they are not representative of PE patients and healthy controls of other ethnicities. Secondly, only 108 PE patients were included in the study due to the low prevalence of PE. This limited sample size may have reduced the statistical power of finding differences between the two investigated groups. Moreover, the small sample size also limits more stratified analyses for the gene-gene and gene-environmental interactions. Therefore, results from future studies incorporating larger samples sizes are required to verify our results. Our results indicate that there was a significant relationship between VEGF +936C/T polymorphism and development of PE, but we did not observe a significant gene-environment interaction. We observed that VEGF +936C/T TT genotype and T allele were associated with risk of PE. However, owing to the limitations of the present and previous studies, more studies with larger sample size, better design, and using detailed patient records need to be conducted. We thank nurses who help us the collect the blood samples for our study. We also thank patients who agreed to participate into our study. The authors declare no conflict of interest in preparing this article. Karumanchi SA, Granger JP. Preeclampsia and pregnancy-related hypertensive disorders. Hypertension 2016; 67: 238-242. Szita B, Baji I, Rigo J. Psychosocial aspects of preeclampsia. Orv Hetil 2015; 156: 2028-2034. Zullino S, Di Martino D, Stampalija T. New lenses to look at preeclampsia. Gynecol Endocrinol 2016; 32: 87-90. Wilson ML, Goodwin TM, Pan VL. Molecular epidemiology of preeclampsia. Obstet Gynecol Surv 2003; 58: 39-66. Jeyabalan A. Epidemiology of preeclampsia: impact of obesity. Nutr Rev 2013; 1: 18-25. Wu W, Yang H, Feng Y. Polymorphisms in complement genes and risk of preeclampsia in Taiyuan, China. Inflamm Res 2016; 65: 837-845. Xiao J, Shen F, Xue Q. Is ethnicity a risk factor for developing preeclampsia? An analysis of the prevalence of preeclampsia in China. J Hum Hypertens 2014; 28: 694-698. Mulla ZD, Gonzalez-SJL, Nuwayhid BS. Descriptive and clinical epidemiology of preeclampsia and eclampsia in Florida. Ethn Dis 2007; 17: 736-741. Campos A. The role of aspirin in preeclampsia prevention: state of the art. Acta Med Port 2015; 28: 517-524. Vitoratos N, Vrachnis N, Iavazzo C. Preeclampsia: molecular mechanisms, predisposition, and treatment. J Pregnancy 2012; 2012: 145487. Akbar A, Abimanyu B, Dachlan EG. The comparison of serum VEGF and sFlt-1 on preeclampsia and eclampsia pregnant woman before and after delivery at Ulin Hospital, Banjarmasin, Indonesia. Pregnancy Hypertens 2012; 2: 243. Brockelsby J, Hayman R, Ahmed A. VEGF via VEGF receptor-1 (Flt-1) mimics preeclamptic plasma in inhibiting uterine blood vessel relaxation in pregnancy: implications in the pathogenesis of preeclampsia. Lab Invest 1999; 79: 1101-1111. Luttun A, Carmeliet P. Soluble VEGF receptor Flt1: the elusive preeclampsia factor discovered? J Clin Invest 2003; 111: 600-602. Zhou Q, Liu H, Qiao F. VEGF deficit is involved in endothelium dysfunction in preeclampsia. J Huazhong Univ Sci Technolog Med Sci 2010; 30: 370-374. Weissgerber TL, Rajakumar A, Myerski AC. Vascular pool of releasable soluble VEGF receptor-1 (sFLT1) in women with previous preeclampsia and uncomplicated pregnancy. J Clin Endocrinol Metab 2014; 99: 978-987. Toering TJ, Navis G and Lely AT. The role of the VEGF-C signalling pathway in preeclampsia? J Reprod Immunol 2013; 100: 128. Muller-Deile J, Schiffer M. Renal involvement in preeclampsia: similarities to VEGF ablation therapy. J Pregnancy 2011; 2011: 176973. Ranheim T, Staff AC and Henriksen T. VEGF mRNA is unaltered in decidual and placental tissues in preeclampsia at delivery. Acta Obstet Gynecol Scand 2001; 80: 93-98. Bosco C, Buffet C, Diaz E. VEGF in the muscular layer of placental blood vessels: immuno-expression in preeclampsia and intrauterine growth restriction and its association with the antioxidant status. Cardiovasc Hematol Agents Med Chem 2010; 8: 87-95. Srinivas SK, Morrison AC, Andrela CM. Allelic variations in angiogenic pathway genes are associated with preeclampsia. Am J Obstet Gynecol 2010; 202: 445 e441. Kim YJ, Park BH, Park H. No association of the genetic polymorphisms of endothelial nitric oxide synthase, dimethyl arginine dimethyl aminohydrolase, and vascular endothelial growth factor with preeclampsia in Korean populations. Twin Res Hum Genet 2008; 11: 77-83. Procopciuc LM, Caracostea G, Zaharie G. Maternal/new-born VEGF-C936T interaction and its influence on the risk, severity and prognosis of preeclampsia, as well as on the maternal angiogenic profile. J Matern Fetal Neonatal Med 2014; 27: 1754-1760. Gu Y, Lewis DF and Wang Y. Placental productions and expressions of soluble endoglin, soluble fms-like tyrosine kinase receptor-1, and placental growth factor in normal and preeclamptic pregnancies. J Clin Endocrinol Metab 2008; 93: 260-266. Guo X, Feng L, Jia J. Up regulation of VEGF by small activating RNA and its implications in preeclampsia. Placenta 2016; 46: 38-44. Zhao M, Yin Y, Guo F. Placental expression of VEGF is increased in pregnancies with hydatidiform mole: possible association with developing very early onset preeclampsia. Early Hum Dev 2013; 89: 583-588. Zhou Y, McMaster M, Woo K. Vascular endothelial growth factor ligands and receptors that regulate human cytotrophoblast survival are deregulated in severe preeclampsia and haemolysis, elevated liver enzymes, and low platelets syndrome. Am J Pathol 2002; 160: 1405-1423. Papazoglou D, Galazios G, Koukourakis MI. Vascular endothelial growth factor gene polymorphisms and pre-eclampsia. Mol Hum Reprod 2004; 10: 321-324. Stanley JL, Sulek K, Andersson IJ. Sildenafil therapy normalizes the aberrant metabolomic profile in the comt(-/-) mouse model of preeclampsia/foetal growth restriction. Sci Rep 2015; 5: 18241. Garza-Veloz I, Castruita-De la Rosa C, Cortes-Flores R. No association between polymorphisms/haplotypes of the vascular endothelial growth factor gene and preeclampsia. BMC Pregnancy Childbirth 2011; 11: 35. Banyasz I, Szabo S, Bokodi G. Genetic polymorphisms of vascular endothelial growth factor in severe pre-eclampsia. Mol Hum Reprod 2006; 12: 233-236. Wu W, Yang H, Feng Y. Polymorphisms in inflammatory mediator genes and risk of preeclampsia in Taiyuan, China. Reprod Sci 2016.